PERTH, Australia - There is no way for Canadian military personnel to work in Afghanistan without "significant risks," Prime Minister Stephen Harper said Sunday in the wake of the death of a soldier in Kabul. When it announced that Canada would end its combat mission this year and undertake a training mission until 2014, the Harper government insisted the troops would be "relatively safe," because instruction would take place behind the wire of fortified bases. However any illusion of safety was shattered on Saturday when a suicide bomber killed Master Cpl. Byron Greff and 16 other people. Harper, speaking after the conclusion of the Commonwealth summit in Perth, Australia, said he was well aware from his own travels that nothing is safe in Afghanistan. "I've always been clear there are still risks involved in this mission," Harper told Canadian reporters. "Any mission in Afghanistan involves significant risk ... Any presence in Afghanistan, as I know from my own travel there, is fraught with risk, so there will remain risk to our defence personnel." Harper added that "we hope, and expect, that casualties will be much significantly lower than they were under the previous mission." Greff is the first Canadian to die in Afghanistan since the combat mission ended earlier this year. His death brings the number of Canadian soldiers killed as a result of Canada's involvement in Afghanistan to 158. Last fall, the Conservatives announced they would extend Canada's presence in Afghanistan without consulting Parliament, arguing there was no need to vote on a non-combat mission. While the Liberals supported the deployment of 920 military trainers, the New Democrats' late leader Jack Layton blasted the prime minister for committing to a mission he predicted "almost certainly is going to involve further lives lost." The NDP joined the Bloc Quebecois in a motion accusing the government of breaking its promise to put military deployments to a vote, but it was soundly defeated. The Conservative's pledge to seek Parliament's approval is strictly symbolic since the government does not need the backing of the House of Commons to go to war. "This mission was sold to Canadians as minimal risk by the prime minister," Jack Harris, the NDP's former defence critic, said Sunday. "This death is the consequence of a decision that was made by the government to continue this military mission in the face of five years of significant combat and significant loss of Canadian life." Jack Granatstein, a research fellow at the Canadian Defence and Foreign Affairs Institute, said there was "a clear rationale" for how the government handled the decision to launch the new mission. 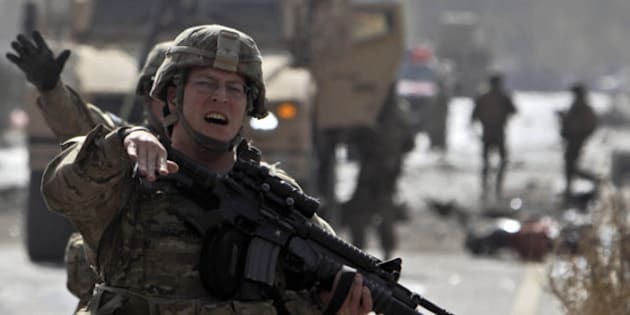 "It seems to me you can justify saying we would not have a vote on the deployment of trainers given their purpose, the fact that while they might be shot at on occasion, their purpose is training rather than fighting in organized units against enemy forces," he said. Greff's death "was not a battlefield death, it comes with being part of a training mission and having to move around the country." "This one is a straight-out terrorist act in the middle of downtown Kabul designed to inflict damage more on the government of Afghanistan ... than anything else." Retired Canadian major-general Lewis MacKenzie, now a military analyst, said the latest death should not be used as ammunition against the training mission. "Some people, especially critics, will react and say 'We told you so,' but let's just keep this thing in perspective," said MacKenzie. While any death is one too many, he said the number of Canadian soldiers killed this year as a result of the military's operations in Afghanistan is dramatically lower than those killed during the previous years of the combat mission. Greff, an Edmonton-based soldier with the 3rd Battalion Princess Patricia's Canadian Light Infantry, was taking a routine trip between training and headquarters bases in the Afghan capital of Kabul yesterday when a car packed with explosives rammed into a heavily armoured NATO bus known as a Rhino. It had been escorted by two heavily armed patrol vehicles. Five NATO soldiers, eight civilian contractors and four Afghans were killed in the blast, and scores of others were wounded. Kabul has become an increasing focus for spectacular Taliban attacks, including a 20 hour shoot-out near NATO's main headquarters and the U.S. embassy last month — a gunfight that involved Canadian troops who had just arrived at Camp Eggers in a convoy. Harper stressed the government remains committed to the training mission and the "international goal of creating a lawful, democratic and self-sufficient Afghanistan."